The Greenwich Concours d'Elegance is a Must-Attend for the Masses. Although over six months have elapsed since the last of the highest caliber competitors rolled off the field at Roger Sherwin Baldwin Park, the 2017 Greenwich Concours d'Elegance is still fresh in my memory. The better events tend to do that. They tend to linger long after the final trophy is handed out and everyone is home prepping for 2018. And with thousands of pictures captured over three days of excitement, even the most trivial details can be triggered with a round through the album. Join me now as I recount one of the best weekends the east coast has to offer. The Grand Tour's first pit stop was at the Malcolm Pray Achievement Center. Despite show days being designated for Saturday and Sunday, the Greenwich Concours officially kicks off on Friday with the Grand Tour, presented by Vintage Rallies. 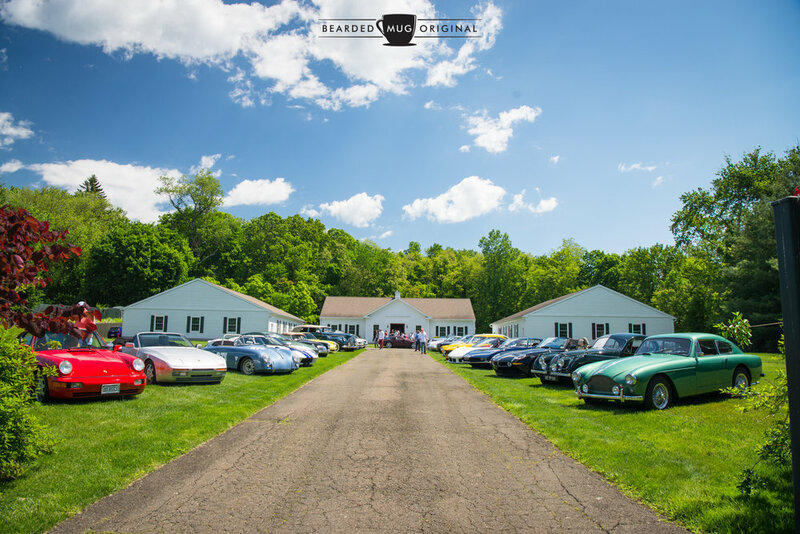 The Grand Tour, which is certainly not to be confused with the one put on by three cheeky Brits, offers participants a chance to drive their cars, some of which are scheduled to appear in the Concours, along the beautiful countryside that New York and Connecticut have to offer. Additionally, it includes planned stops along the way, with lunch at a fine establishment. For 2017, those stops ranged from a morning at the Malcolm Pray Achievement Center (MPAC), a magical place that would require a full week's worth of one's attention to fully take in, to lunch at the Redding Roadhouse, finishing up at the Bruce Museum. Unfortunately, by the time our convoy rolled in, the museum had locked its doors for the day. The Tour itself was a blast. I was able to follow along in my trusty WUTmobile, although at the MPAC, it was relegated to parking out of sight alongside the building. I'm sure it had something to do with being too new amongst its automotive peers, because I made sure to wash it beforehand so it was super shiny. Regardless of parking arrangements, the MPAC was a wonderful place to get lost in. There were three buildings on the property, filled with everything automobilia, including thousands of books, scale models, posters, and advertising material. Then there were the 1:1 cars. My cup runneth over and before I knew it, it was time to get back on the road. The next stop was lunch, held at the Redding Roadhouse. A 3-course meal was included for all participants, and I would be remiss if I didn't mention how delicious every plate was, from the salad to dessert. Unfortunately, while researching the menu, I found that the restaurant has since closed and sold, but should be reopened in the near future. The route towards the restaurant was a long stretch of scenic CT-53, providing an excellent opportunity for photographs as the cars entered the lot. Only one car, the 1952 Cunningham C-3 of Chuck Schoendorf, arrived fashionably late thanks to a flat tire. But like a period-correct pit stop, Chuck was able to fit the matching spare and continue on the tour with no issues. Rich Taylor, of Vintage Rallies, readies the flags to alert the drivers of the chow stop. What a difference a meal break makes. Before the salad was served, the sun was shining. By the time folks were forking chocolate cake into their mouths, clouds had gathered and drops of rain began to fall on the cars, some of which still had their tops dropped. The owners of a 1954 Mercedes-Benz, in particular, made haste to prop up the top on their 4-door convertible, preserving the pristine interior from the moistening of Mother Nature's tears. The precipitation lasted less time than it took to enjoy lunch, and most cars were back in the sunshine before the next stop. The final destination on the tour before returning to the park to get a preview of Bonhams auction was at the Bruce Museum. The ride wasn't without delays, as one driver ran out of fuel in his 1934 Ford Model 40 Roadster. A quick tap on my navigation's "Points of Interest" button revealed a gas station was less than a mile away. After purchasing a few gallons of go-juice in a gas can that enjoyed a 1 million percent mark-up, the hot rod Ford was on its merry way. Unfortunately the museum had closed for the day before the majority of the group arrived. No worries, as the Bonhams auction preview was in full swing and perfect way to end the day. Best seat in the auction house. The day may have ended, but the nighttime offered its own festivities as well! The Cannonball Reunion, held at the Greenwich Library in cooperation with the Greenwich Film Festival and the Greenwich Concours and benefitting the New England Auto Museum, saw a stage full of participants in the original Cannonball Baker Sea-to-Shining Memorial Trophy Dash. Now, I'm sure any car buff can relate, but The Cannonball Run was one of my favorite movies growing up. So to see many of the real people the characters were based off of up on stage trading stories was a few hours I will not soon forget. Videos were shown in place of those participants who couldn't be a part of the panel, which are certainly worth a look-up on YouTube. Pamela Yates, wife of the late, great Brock Yates, was even reunited with a Trooper who had stopped them along the way and let them off with a warning. Pamela also closed with an announcement that a remake of the cult film was being considered by a large Hollywood studio, although she was a bit mum on any other details. Before and after the event, attendees could check out some of the actual vehicles that raced across country, including Bill Warner's 1975 Porsche 911T, the Dan Gurney/Brock Yates Ferrari 365 GTB/4 Daytona that won in 1971, and a meticulous recreation of the TransCon Medi-Vac Ambulance owned by Travis Bell. The BMW E39 M5 of Alex Roy was also in the lot. Roy's M5 was outfitted with technology years beyond its mainstream use in an attempt to break the cross-country record at the time. Saturday started out a bit cloudy, leading into a brief shower, and ultimately ending on a sunny note. In between is what really counts though. You see, Saturday is Concours Americana, which, as I'm sure the most astute of my readers will have already deducted, is all about the good old US of A. And the participants did not disappoint! For the first time in GC history, Hot Rods enjoyed a place at the proverbial table, being split into two classes - Old School and New School. To further emphasize their importance in American car culture, a midday demonstration was held in front of the awards tent. The 1940 Mercury by Ida Automotive, Rick Dore Kustom T-Bird Tango, 1932 Moal Hot Rod, the Marano Collection's 1950 Mercury Custom and the Isky Roadster were all driven to the center of the crowd, while Wayne Carini, Rob Ida, Rick Dore, and Ken Gross spoke about the importance of each car and Hot Rod culture itself. It really added value and substance to the static display of the cars, and given the giant crowd surrounding the speakers, was a pleaser to boot. The balance of the day saw spectators taking in the sights and sounds the Concours had to offer. When it came time to announce the winners, people swarmed the area of the awards tent, claiming their bit of real estate in either the many provided chairs or on the ground that lined the drive-up path. Unlike last year, where rain saturated the ground in front of the tent and prohibited cars from driving up to receive their awards, the cars were able to be exhibited and talked about as they made their way to collect their beautiful trophies. When all was said and done, a 1935 Packard Twelve Dual Cowl Phaeton was honored with the Best in Show accolade. The maroon marvel, owned by Al and Sandra San Clemente, was completed the night before the show! The People's Choice went to a 1931 Cadillac 452A All-Weather Phaeton owned by Charles B. Gillet. A complete list of the winners can be found HERE. The People's Choice Cadillac approaches the podium. The Best in Show Packard can be seen behind it. Sunday is my favorite day. It's no secret that I have an affinity for foreign metal and the showfield is filled with many such treasures. The American Bugatti Club enhanced the appearance of the shoreline by parking nearly 20 classic Bugattis against the water. Some of the club convoyed in Saturday night, leaving the cars on the field to greet the rising Sunday sun. Besides the band of Bugattis, the first car corral closest to the awards tent was filled with Ferraris, including a 1953 166 MM Barchetta presented by Redline Restorations. The weather held until the award ceremony, when the rain fell a bit harder than it did the previous day. Undeterred, the winners still drove up to receive their prestigious trophies, adhering to the wipers on/headlights on law. I would like to say that the clouds parted for the People's Choice and the Best in Show, but sadly, they did not. Regardless, the people chose the 1937 Delahaye 135M Competition Short Wheel Base Roadster of Myron Schuster as their choice. The Best in Show, a stunning 1938 Bugatti Type 57C Atalante, was displayed by a private collector. All of the International winners can be found HERE. The Best in Show (l.) and People's Choice (r.). Accompanying the actual Concours cars, sponsors line the perimeter of the show to provide an outlet for non-automotive perusal. Additionally, there are Powerball-sized yachts docked at the Delamar Greenwich Harbor, allowing some wishful thinking to materialize into tangible possibilities. For the two-wheel fans, motorcycles were exhibited on both days. The aforementioned Cannonball cars also had a place on the field, and Captain Chaos could be seen roaming about. For the younger crowd, a corral of child-sized pedal and motorized cars enlarged the eyes of many a youthful spectator. The Hagerty Youth Judging program returns to groom the next generation of Concours judges. The Greenwich Concours d'Elegance is more than just a Sunday show and shine. It's more than just an event in which people bring rare automobiles onto a field and collect their novelty trophies after winning. It's more than the cars themselves. The Greenwich Concours is a three-day weekend that combines prestigious automobiles, notable personalities, generous donations, and family fun. As a photographer, living in the moment for me is perpetual. Not only do I get to capture all the fine details of a car, but I get to revisit them every time I look at the pictures. And you can, too, at the links below. Also, make sure to mark your calendar for the 23rd Greenwich Concours, taking place on June 1-3, 2018. More information can be found HERE.